This is the second picture I painted inspired by my new book, Daughter of the Howling Moon. This drawing portrays the essence of the novel as opposed to an actual scene. Benjamin Sol is the co-protagonist (like that term? I just made it up. Bethany Ann is the main character and hero, but Benjamin plays a huge part as well, thus the term.) Benjamin is the deputy sheriff of St Claire Parish. 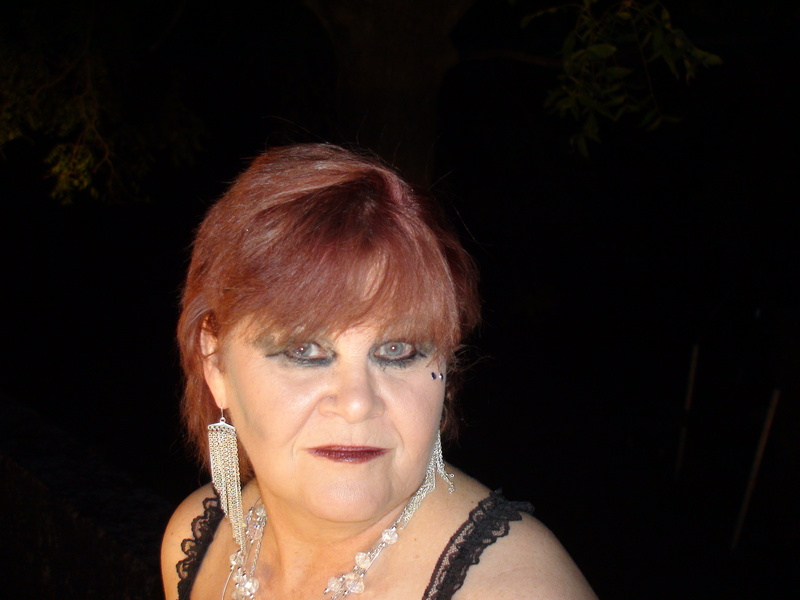 His boss, Sheriff Buford Tate sends him to the local voodooenne, Lady Tibitha . Why? Nope. Not gonna tell ya. Gotta wait for the book. What is channeling? Very simply put, channeling is receiving messages from a higher connection. A person usually goes into a trace state and relays information received from another, higher source. Edgar Cayce, aka the Sleeping Prophet, is about the most famous channeler out there. While in a hypnotic trance he would predict such things as wars, healing, Atlantis, reincarnation, the Akashic records, and the end of the world. If you recall the movie Ghost with Patrick Swayze and Demi Moore, Woopie Goldberg’s character channeled the ghost of Patick Swayze’s character. At one point, she allowed Patrick to enter her body so that he could speak and react directly with Demi Moore’s character. When I started my spiritual journey I wanted to channel and was pissed off royalty that I couldn’t. Here again, I was making something hard out of something easy. I went to various channeling sessions given by others. I thought I had to put myself into a trace, shut my eyes, the whole nine yards. It wasn’t until I started writing that I discoveded I was channeling. As a writer I’m often asked where the ideas for my characters come from. I’ve also been asked how do I make my dialogue so real? The characters so real. Well, here’s the deal. I channel them. While typing, my characters come into me and I am literaly writing with their fingers using their exact words and stories. Now, I know there are many out there who are rolling their eyes and thinking, “Wow, this girl is a nut job.” I used to say this doesn’t bother me, but to be honest, their doubt and ridicle does. A closed mind is just plain stupid. There I said it. Deal with it. Currently, I am working on my next novel, The Church of the Howling Moon.” This book, more than all the other books and stories I’ve written, is strickly channeled information. All I had when I started the story was the title. I typed it on the paper and then asked myself, “What next.” The next thing I wrote was, “I bow before no man but kneel only at the altar of the Church of the Howling Moon.” Where the hell did that come from? When the time came to give a name to my main character, without even thinking I typed out Bethany Ann. What? My women characters are strong. They usually have names like Raven and Dixie. Bethany Ann is too girly for me. But. It wasn’t me I was dealing with. It was Bethany Ann. Let me tell you, Bethany Ann is very powerful and can hold her own. I literally wrote the first ten chapter strickly listening to Bethany Ann. I had no idea where she was leading me. I’d end on chapter, wonder to myself what I could write for the next one, and there it was. The words flowed and it the best writing I’ve done to date. Bethany Ann did end up giving me the story plot and some idea where this story was going. However, she still throws in twists and turns that floor me. I know where the story is headed now, but have no idea how to get there. I’ve spoken with my writing buddies concerning the ending. We’ve kicked around dozens of ideas but none really have hit home. I’m not worried. When the time comes, Bethany Ann will tell me. I believe all great writers channel. So, my wish came true. I am a writing channelor. The tenth Major Arcana card is The Wheel of Fortune. It is the Karma card. I’m a firmer believer in Karma and try only to accumulate good Karma, not bad. Karma follows you from one lifetime to another. Each lifetime you have the opportunity to satisfy whatever Karma dogs your steps so that you won’t drag it into another reincarnation. The goal is not to rack up any more bad Karma along the way. Otherwise the cycle will never be broken. I believe I’ve satisfied all Karma I drug into this lifetime. I am Karma free, baby and try very, very hard to stay that way. I now have what my witchy friends and I call, “boomerang Karma.” Anytime I slip backwards into old habits of trashing someone or thinking thoughts of revenge and payback, Karma immediately hits me upside the head. This phenomena can be quite painful (literally and figuratively) which is why I strive to stay on the straight and narrow. However, I’m comforted knowing that I’ll pay for my wickedness right away instead of it being a ball and chain I carry from life to life. The Wheel of Fortune means a turning point in your life is coming. It stands for opportunities, progress, advancement, and the beginning of an new cycle. 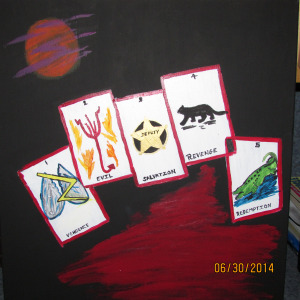 The card is ruled by the planet Jupiter and the god Zeus which and who, are bringers of good fortune. Thinking outside the box, anytime a client throws the Wheel of Fortune card, I suggest if they are going to a casino, to play The Wheel of Fortune slot machine. Ya’ got nothing to lose and everything to gain. Message for the week: Do something positive. Create good Karma. I’ve said before that I have favorite Tarot cards. The Hermit is right there at the top. Client reactions to this card puzzle me. Believe it or not, most of them gasp and think the card is a bad sign. First of all, I don’t think any card is a bad. Yes, there are cards that look damn scary and do symbolize the non-productive aspects of life. But every cloud has a silver lining, and so do the cards. Second, why does this card look spooky? The first thought that went through my head when I saw the card, was loneliness. It is the Hermit, after all. 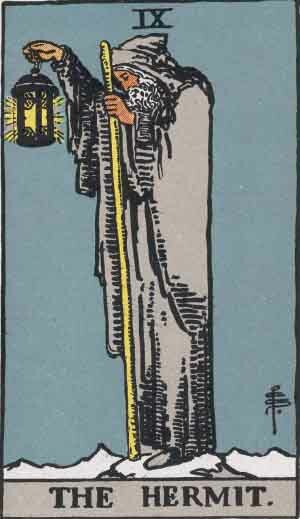 The Hermit holds his light high and shows others the way. Teachers, counselors, preachers, and instructors could throw this card. When you think about it, Jesus would throw this card in a New York minute. Now, that’s a bold statement! Jesus getting a tarot reading. Oh, boy. I can see it now. Over-zealous religious folk are gathering the wood to burn me at the stake right now. But why? Didn’t Jesus light the way? The Hermit looks for answers that rest inside you. The card’s astrological sign is Virgo. Virgos are notorious planners. They have a plan A, B, C,D and always an F. The Hermit, therefore signifies plans and ideas in the making. The cards stands for wisdom, solitude, peace, and humility. The Hermit is always searching and gathering information that he/she shares without preaching or judgement. If a client threw this card, depending on the cards surrounding it, it could mean they need to seek outside counsel for their situation. Or it could mean they need quiet time. A vacation away from the hustle and bustle of life to rest, relax, and think about what it is that’s bothering them. 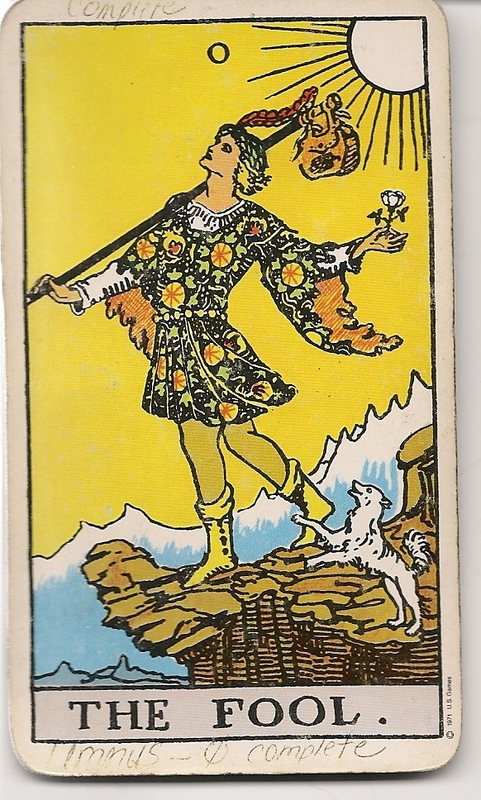 The flip-side of this card (for me) is that “it’s lonely at the top.” Everyone rushes to The Hermit seeking advice, but who does he run to? If reversed in a reading, (Reversed means the card is up-side-down to the reader) it can mean ill-advice and deception or the client is refusing outside help. Here’s the message for the upcoming week: Quiet time does a body good. If you are bothered by a problem and can’t find the solution, TURN OFF THE DAMN CELLPHONE, STOP TEXTING, GET OFF FACEBOOK AND TWITTER. Pour a glass of wine, sit on the deck, quiet the soul, and go within for the answer. You might be surprised how easy it comes. The eighth card in the Major Arcana is Strength. This is another favorite card of mine. In older decks, this card was often labeled The Power card. 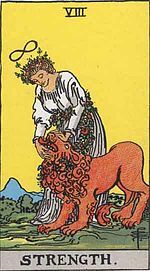 The card’s ruling sign is Leo. Leo the Lion. Tons of power and strength there, so it’s only fitting that the King of Beasts is portrayed front and center. But what about the girl? Where does she fit in? This card is not only about strength but balance as well. The gentle woman needs the hot, roaring energy of the lion. The lion needs the gentleness of the woman. Together, strength and gentleness combine to make powerful energy. This card represents the taming and understanding of our wild side or the melding of the emotional and physical. The card shows up when strength and power of action is needed. It’s confidence and courage. A diplomat or arbitrator would draw this card. But zoo keepers and vets could throw this card as well for obvious reasons. Of course, the down side of the card is the exact opposite, as is usually the case. indecision, weakness, surrender, and defeat. I read somewhere that this card represents the Bible story of Daniel in the Lion’s Den. Daddy gave me great advice once concerning this story. He said it’s one thing to be thrown into the Lion’s Den but quite another to jump into the pit. Meaning, wisdom and self-control verses stupidity and foolishness. If thrown into a hairy situation against your will, you will be protected. But to willingly jump into harm’s way? Well . . . that’s a different story. So what is the message for the upcoming week? Think before you act. Temper anger and unproductive energy with gentleness and kindness. Don’t be so hard on yourself. Don’t jump to conclusions. Listen to your little voice and don’t march willingly into hell even for a heavenly cause. Oh! Almost forgot. Pet a lion this week. Ha! Kidding. (That would be jumping into the lion’s den.) Pet a cat or dog instead. It does a body good.